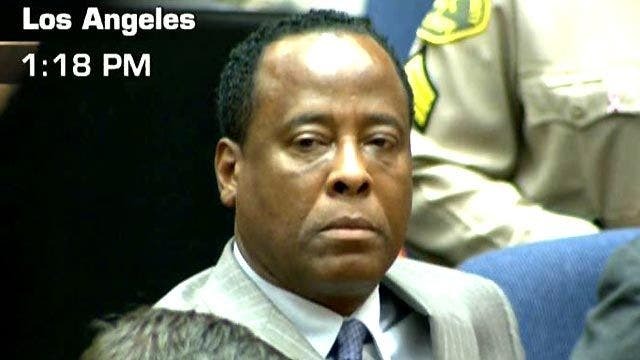 memories of Michael Jackson "the king of pop"
A jury found Michael Jackson's doctor guilty of involuntary manslaughter in the 2009 death of the King of Pop. Jackson's sister LaToya screamed out upon hearing the verdict, while his crying mother, Katherine, was consoled by her son, Jermaine Jackson. Murray's supporters looked somber over the news, with one shaking her head back and forth, mouthing the word "no." Jackson fans who had gathered outside the courtroom burst into applause and cheered as the verdict, "Guilty!," was announced. Jackson died on June 25, 2009. The complete story of his death finally emerged during the six-week trial. It was the tale of a tormented genius on the brink of what might have been his greatest triumph with one impediment standing in his way -- extreme insomnia. Testimony came from medical experts, household employees and Murray's former girlfriends, among others. The most shocking moments, however, came when prosecutors displayed a large picture of Jackson's gaunt, lifeless body on a hospital gurney and played the sound of his drugged, slurred voice, as recorded by Murray just weeks before the singer's death. Jackson talked about plans for a fantastic children's hospital and his hope of cementing a legacy larger than that of Elvis Presley or The Beatles. Throughout the trial, Jackson family members watched from the spectator gallery, fans gathered outside with signs and T-shirts demanding, "Justice for Michael," and an international press corps broadcast reports around the world. The trial was televised and streamed on the Internet. Murray's lawyers sought to show the doctor was a medical angel of mercy with former patients vouching for his skills. Murray told police from the outset that he gave Jackson propofol and other sedatives as the star struggled for sleep to prepare for his shows. But the doctor said he administered only a small dose on the day Jackson died. Lawyers for Murray and a defense expert blamed Jackson for his own death, saying the singer gave himself the fatal dose of propofol while Murray wasn't watching. A prosecution expert said that theory was crazy. Murray said he had formed a close friendship with Jackson, never meant to harm him and couldn't explain why he died. The circumstances of Jackson's death at the age of 50 were as bizarre as any chapter in the superstar's sensational life story. The coroner ruled the case a homicide and the blame would fall to the last person who had seen Jackson alive -- Murray, who had been hired to care for the singer as the comeback concerts neared. Craving sleep, Jackson had searched for a doctor who would give him the intravenous anesthetic that Jackson called his "milk" and believed to be his salvation. Other medical professionals turned him down, according to trial testimony. During the last 24 hours of his life, Jackson sang and danced at a spirited rehearsal, reveling in the adulation of fans who greeted him outside. Then came a night of horror, chasing sleep -- the most elusive treasure the millionaire entertainer could not buy. Finally, Murray told police, he gave the singer a small dose of propofol -- 25 milligrams -- that seemed to put him to sleep. The doctor said he felt it was safe to leave his patient's bedside for a few minutes, but Jackson was not breathing when he returned. A guard said Murray was concerned with packing up and hiding medicine bottles and IV equipment before telling him to call emergency services. Prosecutors said Murray was distracted while Jackson was sedated, citing Murray's cell phone records to show he made numerous calls. The defense team countered with its own expert who presented calculations suggesting that Jackson gave himself the fatal dose. In closing arguments, the prosecutor said the mystery of what happened behind the closed doors of Jackson's bedroom on the fatal day probably would never be solved. Fox News' Lee Ross and the Associated Press contributed to this report.